By Karrar Haider in Desktop. Updated on January 21, 2017 . You may be able to type faster on the keyboard, but at some point you get tired of typing repetitive words. From writing your email address to typing some common words that you frequently use, repetitive typing can be a big productivity killer. However, a text expander app can be the perfect solution for this problem. 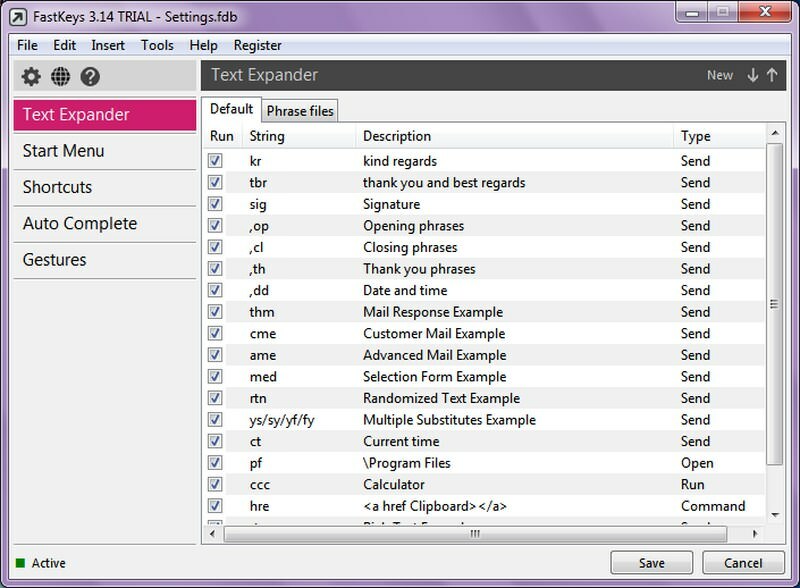 Text expander apps allow you to automatically fill commonly used long sentences with short abbreviations or keyboard shortcuts. Although it does require some initial setup as you need to specify phrases and their triggers, but it’s all worth it when it helps you save hours of your time. If you are convinced to try out a text expander app, then we know a handful of good ones. Below is a list of the best text expander apps for Windows. It’s an easy-to-use text expansion app that’s completely free for personal use. It allows you to use both keyboard shortcuts and abbreviation text as triggers to automatically input specified phrases. There are many built-in templates to help you get started, and you can take advantage of smart search to automatically search for queries on different websites right from your text editor. Additionally, its built-in autocorrect is quite handy that will automatically fix most of the common mistakes. You can use boilerplate templates to fill spaces with usernames, email entries or add date and time stamps. There is also a clipboard cache feature that can record and save all copied data to clipboard and let you use it anywhere. Apart from handy features, PhraseExpress is highly customizable and gives full control over how, where and when you would like to auto-expand text. Price: For personal use, it is completely free. For commercial use, it costs $139.95/year. 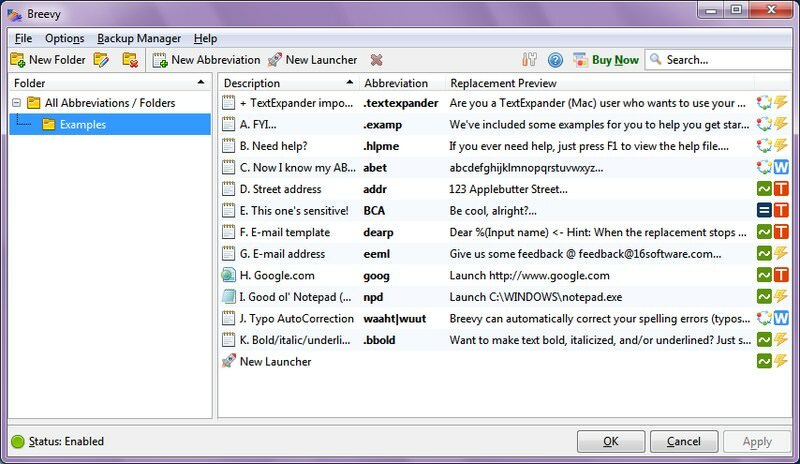 TextExpander completely focuses on offering most customizable snippets to expand text. There are no side features unlike PhraseExpress, but this is also one of its main strengths as it focuses on only what is important. TextExpander lets you create text, images, and link based snippets with automatic time/date stamps. You can either create plain text snippets or use formatted snippets that will not lose their formatting when used. 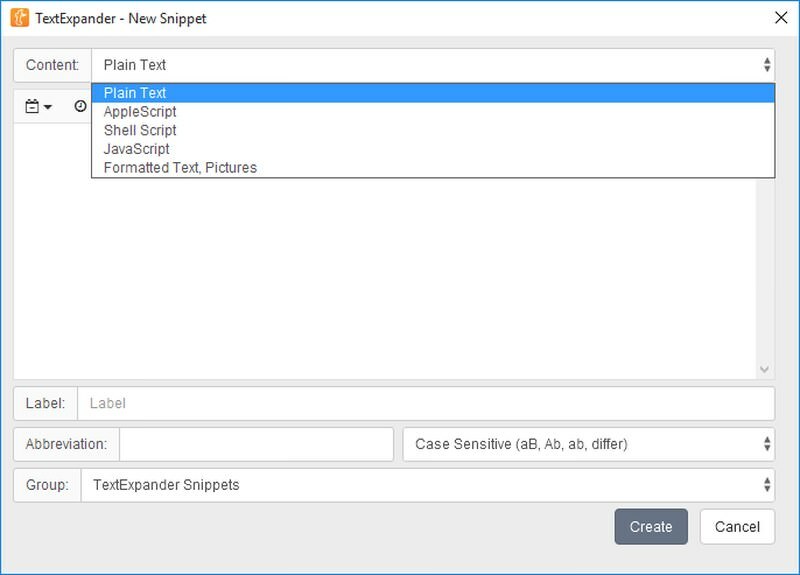 You can also create snippet groups, specify case sensitivity, add keyboard buttons, manage cursor position and more. On top of this, it will also remind you to use the snippets if you forget. Price: For single user package, $3.33/month. For team package $7.96/month. FastKeys is actually an all-in-one Windows automation system that allows you to automatically control Windows programs and settings using commands. It has an extensive text expander feature that allows you to create abbreviations to automatically enter long phrases. Unlike other text expanders, FastKeys doesn’t only work in a text editor. You can also specify abbreviations to quickly open up Windows programs or control Windows features. Its interface is dead simple and you can see the examples to quickly create your own snippets. Additionally, it has many handy templates that you can use to get started. Apart from expanding text using abbreviations, you can create gestures that will either enter a text phrase or control a function of Windows. Similar to PhraseExpress, it can also keep a complete record of clipboard history. The best feature of FastKeys is that its trial version includes all the features; the only limitation is that it comes with a reminder to upgrade to pro. This means that you can use the software for free forever if you don’t mind closing a popup at the start. Price: Trial version with upgrade reminders is completely free. Paid version removes initial popup and costs $9.99. 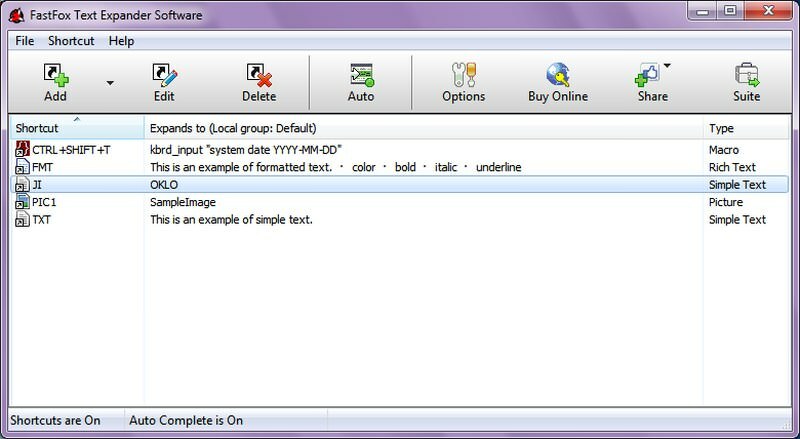 Breevy is similar to FastKeys as it offers the ability to control Windows features along with text expansion. However, I didn’t find it to be as intuitive and it also seemed somewhat lacking in control. Breevy interface is simple, all you need to do is to click on "New Abbreviation" or "New Launcher" button to get started. New text expanding abbreviation can be set to be applied immediately or after a trigger key, and you can also control case sensitivity. whether they should be opened as administrator or not. Breevy options are quite customizable, allowing you to create abbreviations from selected text, manage data on clipboard, sync data over dropbox, and make its interface similar to TextExpander (good if you are switching from TextExpander). Price: A single lifetime license costs $34.95. Offered by NCH Software, FastFox is another easy to use text expander app that lets you set keyboard keys and abbreviations to enter long phrase. You can automatically enter text, formatted text, and even images. It interface itself is very minimal, you can click on the "Add" button to start creating abbreviations. Unfortunately, FastFox does not offer many customization options, you can only specify a phrase and its abbreviation. Additionally, you have the option to choose from where you would like to copy the phrase. A unique and important feature of FastFox is its smart autocomplete that learns from you. It tracks which sentences you use most often and gives you the option to automatically complete it the next time you start typing it. This feature can even remove the need of creating manual lists of abbreviations. This feature alone is enough to choose FastFox over other text expander apps. Price: A lifetime license costs $39.95. 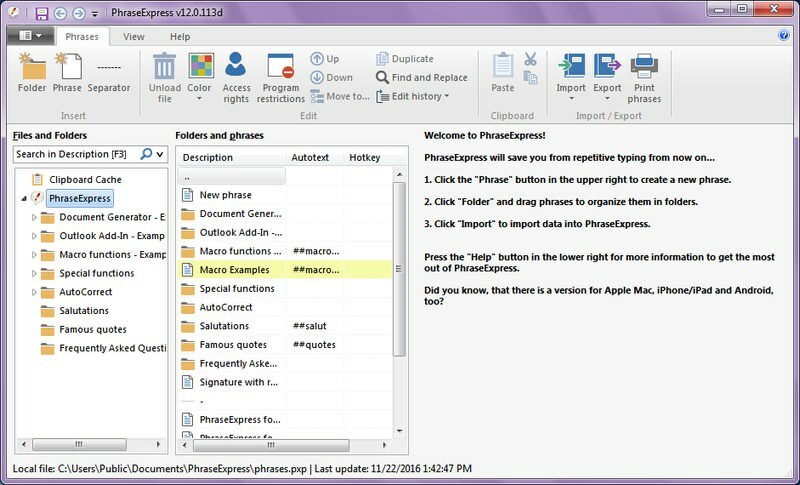 PhraseExpress is definitely the best free tool to expand texts, but no one can beat the customization option TextExpander has to offer. However, if you want best of both worlds, then give FastKeys a try as it allows you to both expand phrases and control Windows. Another important thing to note is that all these programs have a free or trial version, so make sure you check them out before buying the paid version.